As the fall semester is coming to a rapid close, Cameron students and faculty are gearing up for finals, the holidays and another semester. With every semester that comes and goes, the university welcomes new opportunities, hardships and student experiences to look forward to. 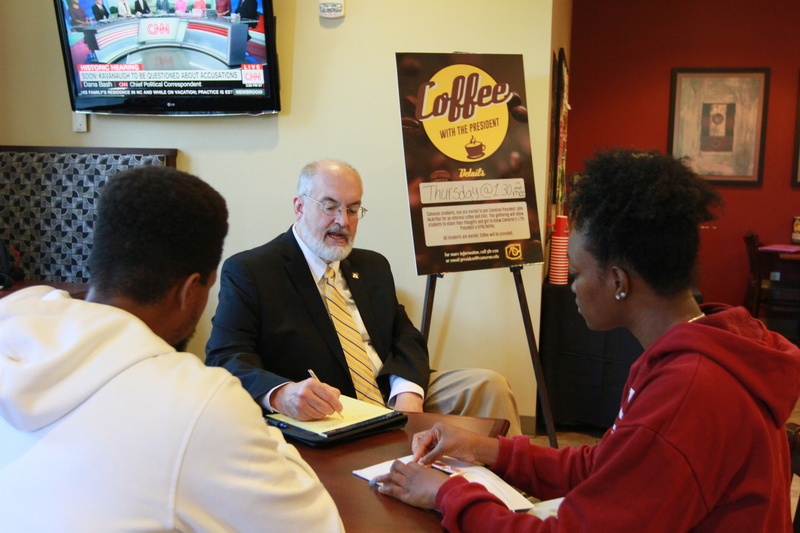 On Nov. 19, President John McArthur hosted Coffee with the President in the McMahon Centennial Complex to discuss Cameron with any students. McArthur discussed his thoughts on the ending of the fall semester and what lies ahead for Cameron. McArthur expressed excitement for the increased enrollment for the spring semester and an understanding of the students who work through obstacles to come back every semester. “More students are continuing their education, which is something I really continue to work on and strive for,” he said. “We want students to get those degrees. I understand that so many of our students are working two to three jobs; they’re caregivers for other human beings, and it can be so hard for them to get through school. This semester, Cameron has received many awards and accreditation reviews for academic programs, such as the music department, biology program and the respiratory care program. McArthur said Cameron completed many achievements during the fall semester, particularly in ways where students were given more opportunities for academic achievement, scholarship and representation. McArthur said he loved the opening of the CU Duncan campus Biology laboratories shortly after Labor Day weekend. Along with the opening of the new biology labs at CU Duncan, the Lawton campus has also experienced a milestone: this semester the university initiated the start of a new seasonal sport: the women’s cross country and track team. “I have enjoyed learning about and getting to know the young women who are members of the new cross country and track team,” McArthur said. “It’s a new sport for us, and they have had astounding success in their first term. Another achievement McArthur said made him excited was the introduction of the new associate’s degree in Strategic Communication, which will offer students another route for success as they make their way through college. McArthur said last, but not least, that his favorite achievement from the semester was the representation of not only the student body, but also of a student organization through a special event held to honor the memory and history of Indigenous Peoples through the first annual Indigenous Peoples’ Day. “This was Lawton’s first Indigenous Peoples’ Day,” he said. “We made a presentation to the City of Lawton, and they agreed to create that. I am really proud of the members of the student association with no help and no precedent and still doing it all on their own. With there being no short in student and organizational achievements at the university, McArthur said Cameron wants to enhance the approachability and knowledge of the university through prospective students, so students can continue to be successful in their own ways here. “We are working on the functionality of the university,” he said. “We’re working on changing out our website to make that more approachable by prospective and continuing students. 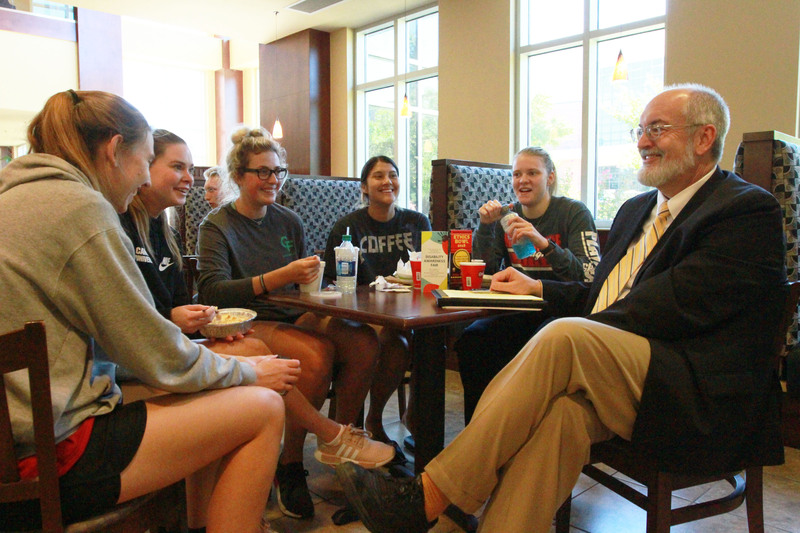 Reflecting on the past semester, McArthur took a moment to ponder on his fondest memory from his fifth year as the President of Cameron University. McArthur asked to share a closing note to all students of the university as the end of the semester nears and they venture into new semesters, paths, and careers. “My hope for the holidays approaching and the semester ending is for my students to have safe travels,” he said. “Make good choices, finish strong and finish with the same enthusiasm in life you had coming into the semester.